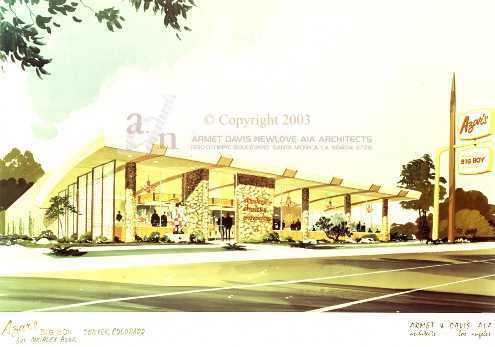 Armet & Davis were the most well known of the Los Angeles-area architects of Googie-style coffee shops. 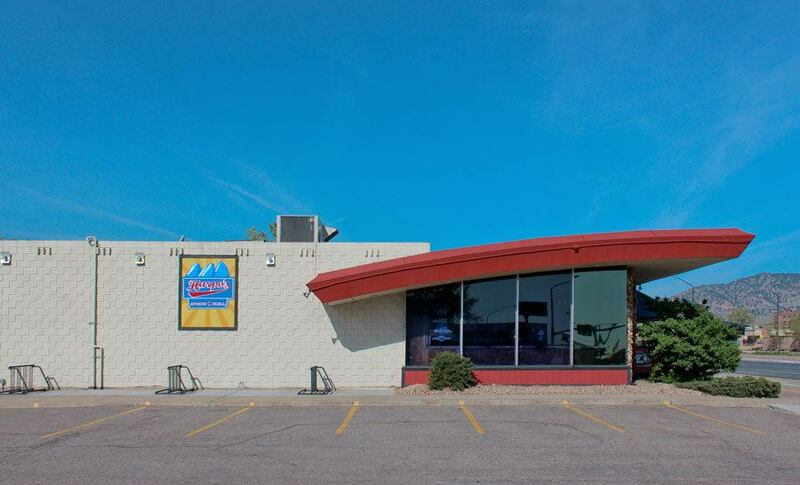 They also contributed to the Front Range landscape with their many White Spot designs, and even designed buildings for Azar’s Big Boy, like this Boulder location depicted above. The Big Boy restaurant chain subfranchised under different names around the country. 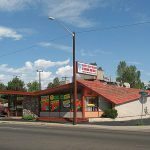 While most famous for their California brand Bob’s Big Boy, in Colorado (and Indiana) they were known as Azar’s. Man this takes me back. 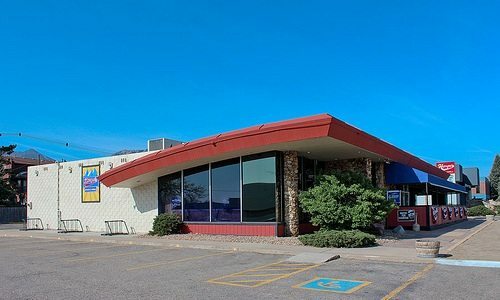 I used to eat at Big Boy all of the time as a kid, and I could swear there used to be one on South Sheridan, perhaps where Rosemary Cafe is now. 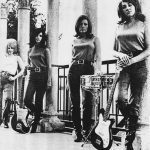 But I could be mistaken (the building, for one, doesn’t look like an Armet & Davis design). There was a Big Boy at 12th or 13th & Lincoln, I believe. I have heard that Rosemary’s Cafe was once a Big Boy. Yes, the design is quite different than this building. I also found that 13th & Broadway Big Boy on the DPL photo site. Fascinating. I did not know that the Big Boy brand was anything other than Bob’s. Rosemarys was a big boy. It looks like there was an addition put on the north side of the building at one point. We used to eat at Big Boy’s after church on Sunday’s… in Anderson, IN. There were at least two in town, but I think they were both “Bob’s.” I’ll try to snap a few pics next time I’m home. Hey Dan, I didn’t think anyone on this Denver-based site would care for me to be more specific, but Azar’s was in *North* Indiana. Legend has it that some Boulder High students stole the Big Boty statue in the 70s and that it still rests in storage somewhere in Boulder County. There is a Big Boy on top of a pizza place on E. Colfax. 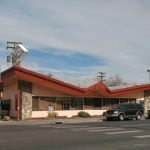 There was an Azar’s Big Boy on E arapahoe rd and S. Quebec st. It has been at least 5 restaurants since! My mother use to work at Azar’s Big Boy as a manager back in the 70s on Broadway and Lehow, just south of Belleview, across the street of, at the time, Burt Chevrolet. In fact I still have the tie clip and charm necklace that was given to me 35 years ago. I sure had a lot of fun in that old restaurant. The Great Scotts Eatery at Highway 36 and Pecos was an Azar’s. I used to eat there when I was a kid. Big Boy restaurants was great all over the US in the 50’s 60’s and 70’s. the 80’s saw them phasing out. The new Big Boys are now in CA,Michigan, Mo and coming soon near you! 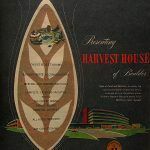 The great foods, service, and modern family atmosphere still exists! 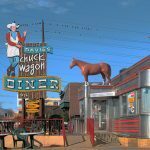 All over our nation you were always “Home” at the Home of the Big Boy ! Bob’s, Kip’s, Vip’s, Elby’s, Azar’s, Top’s, Marc’s, JB’s, TJ’s, Frisch’s, etc. I know I was there!!! Mark G. Kip’s of Okla. Inc. The New York Deli News on Hampton was the big one I remember complete with huge Big Boy out front. Original building with waiting room in front still intack. 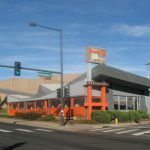 There was a Big Boy Restaurant in the 4100 block of E. Colfax on the north side of the street. My brother, myself and my Grandparents used to go there whenever they took use out to eat. It later became a Perkins and has now been replaced by a bank. Leave us your thoughts at the bottom of this page! We loved Bob’s Big Boy back in the day. If you like old beer nostalgia and collectibles, check out http://www.oldbeerstuff.com! Find out where to bet on our beloved Denver Broncos at Casino Sites USA.